I suggested that we go with a macaroni grilled cheese for this past Sunday’s sandwich but I was shot down. (The sous chef was worried that the sous chef’s husband (aka my dad) would eat too many carbohydrates and it would affect his sugar. FYI: The sous chef’s husband is a diabetic.) Instead of simply shooting me down and saying create something else, they actually came up with their own creation/idea: asparagus with cheese and some sort of mustard. I really did not want to like their idea, but after I thought about it for 2 seconds, it actually sounded good so I went with it. Echoes of Ireland’s capital are evoked by this simultaneously simple and gourmet cheese. Quite daringly different, Dubliner is a specialty cheese with a distinctive mature rounded flavour and a natural hint of sweetness achieved by combining a secret recipe and the skills of the Kerrygold master cheese maker. The cheese is typically matured over 12 months during which time it is checked by experienced cheese graders to ensure that it has a consistently high flavour profile. At my local market is a lady cheese monger who sometimes annoys me and sometimes is helpful. This past Sunday, thankfully, was one of the few times that she was actually helpful. She sets up a table in front of the cheese and samples random cheeses, some of which are on sale. For some reason, this past Sunday, she wanted me to try Dubliner Cheese, which she said is part Parmesan and Cheddar. I am glad she did. This cheese was crumbly and creamy all mixed into one. And oh yeah, it melted well. Awesome for sure. The “mustard” sauce was the only unknown when it came to creating this grilled cheese. I had thought about simply googling a mustard vinaigrette recipe when the sous chef suggested a recipe she had from an old friend (that is also Passover safe). After looking it over, I was convinced this was the way to go. The recipe is above, but I used a regular onion and about 1/8 cup of olive oil as ours is strong and almost overpowered my orange vinaigrette. After creating the vinaigrette, I needed to decide how I would integrate it into the grilled cheese. The original plan was to simply drizzle it over the asparagus after it was added to the sandwich but that seemed pretty boring to me. Since the plan was to grill the asparagus (after steaming them), I thought why not grill the asparagus in the vinaigrette? This way, the asparagus would inherit the lemon-pepper flavor as it was grilling and I would not need any extra butter or olive oil for grilling. 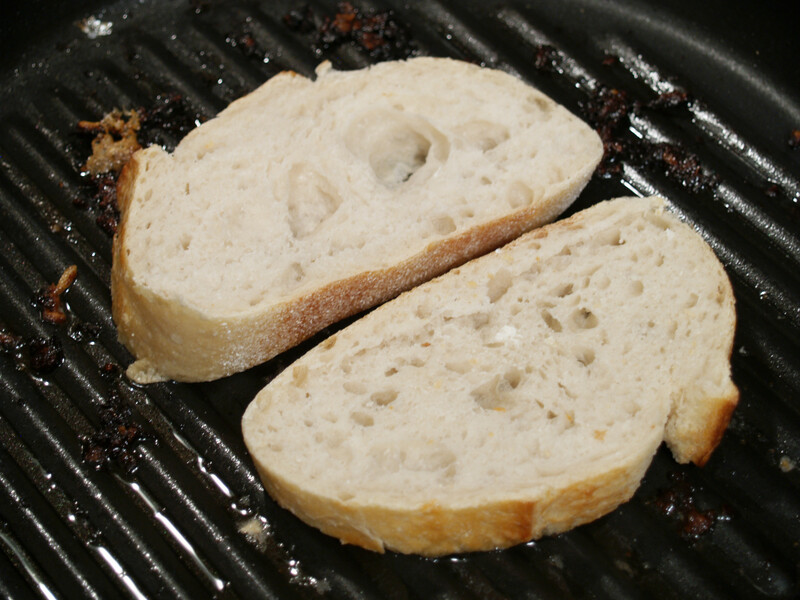 One of the only grilled cheese ingredients that I was able to choose was the sourdough bread. I had hoped to use sourdough for awhile now, but other breads were more suited for my creations so I chose them. This week, the sourdough was on sale, and it was perfect for this grilled cheese. 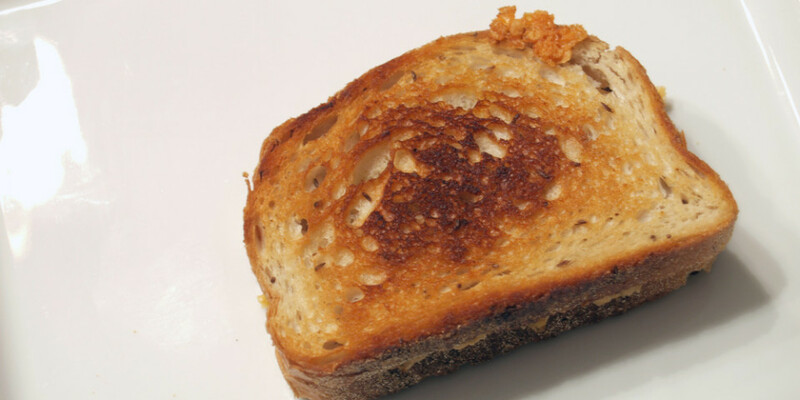 I feel like sourdough is a great bread for grilled cheeses that holds ingredients perfectly and browns nicely, giving the sandwich a great crunch. Oh sourdough, how I love thee. I have never cooked bacon. I have never eaten bacon. (Remember that whole Kosher thing?) However, I have seen in cooking shows, I believe, where they cook bacon (or some type of meat) in a pan, take said meat out of the pan and then use the pan to continue cooking the meal. I decided that I would do the same, just with the leftovers from grilling the asparagus/vinaigrette and the buttered sourdough. How could absorbing lemon-pepper vinaigrette into the sourdough bread be a bad thing? My thoughts exactly. 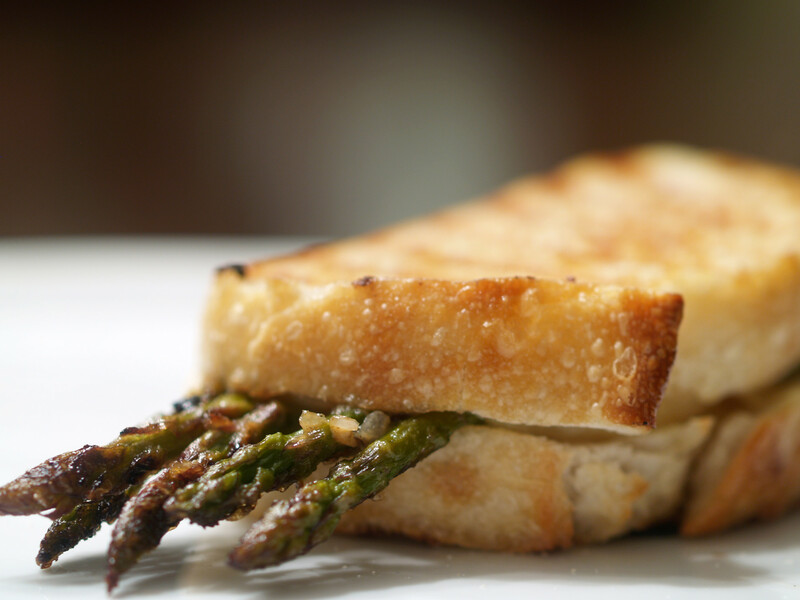 I ate this asparagus and lemon pepper vinaigrette grilled cheese and loved it. 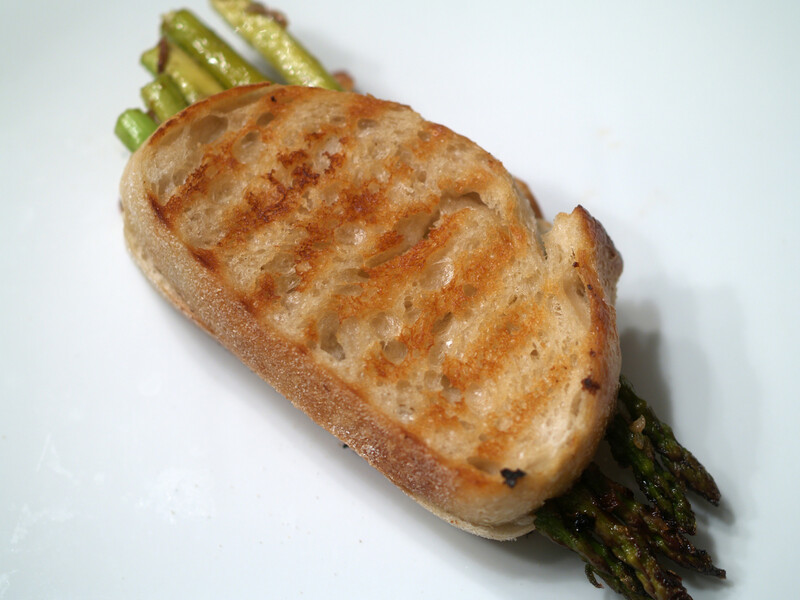 This grilled cheese was a winner that had great flavor (sweet and tangy) and texture (crunchy on the outside and soft, even the asparagus, on the inside). It was not totally my recipe, but who says you can’t get some help from the people around you? However, I finished eating my artichoke after the grilled cheese so all I remember is what the artichoke tasted like and not the grilled cheese flavor. Great memory I have, eh? I now know that I must take notes as I eat so I will have a better description of flavors and textures within the grilled cheese. 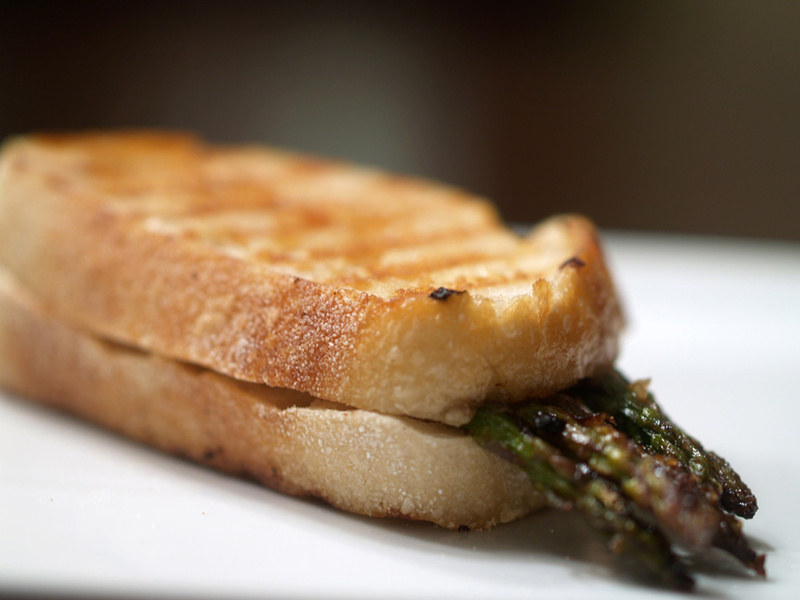 One of the many things that was great about this grilled cheese, that I have yet to mention, were the whole asparagus in the sandwich. There was debate as to whether to cut them up or leave them whole. 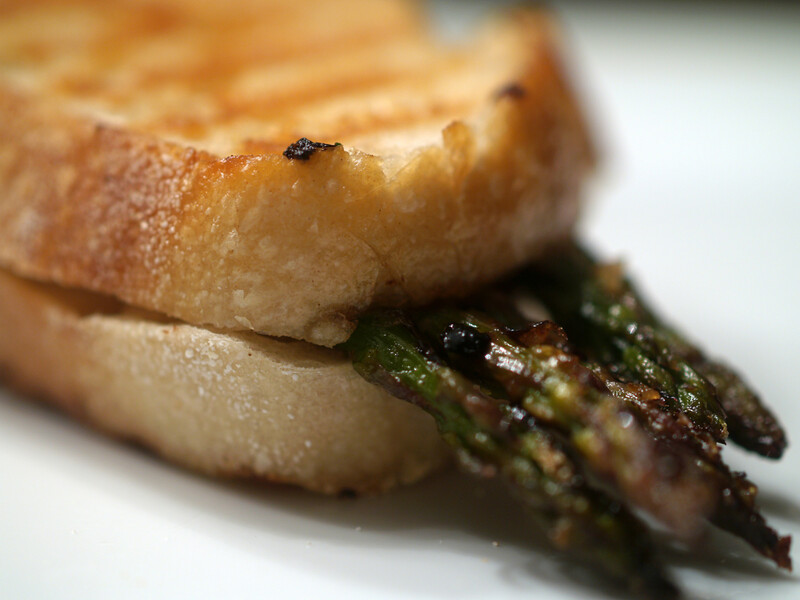 Besides the fact that the asparagus overflowing the bread looks great, it also tasted great. A win-win for sure. 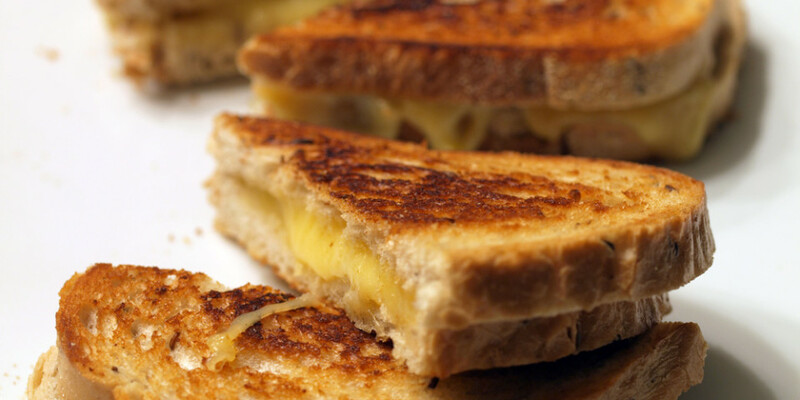 Recently, I have had some yummy grilled cheese creations that I am very proud of. With these last two sandwiches both including vinaigrette, I believe I have started to branch out even further and push my mind and skills. I only hope that this streak of great grilled cheese sandwiches will continue. Tonight is supposed to be BLTuesday but this sandwich is now an obsession! We almost always have Kerrygold Dubliner (hubs’ favorite) in the fridge and the lemon vinaigrette just sounds sooooo good. My sandwich is an obsession for you?!? Awesome! Thanks so much! Please let me know if you do end up creating this sandwich. I would love to see what you think. I am so pleased to have found your recipe. 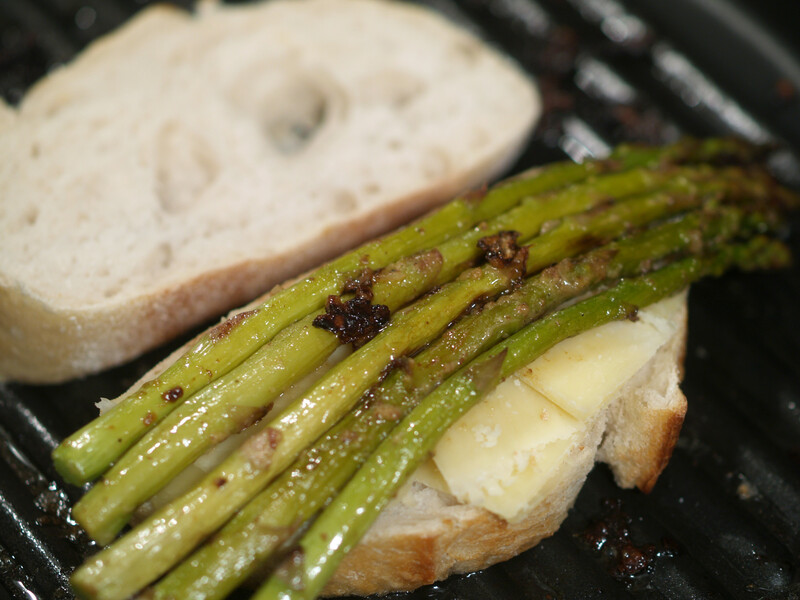 I baked sourdough this weekend and was trying to figure out how to incorporate asparagus and cheddar. What excited me most about finding your blog was that I actually had Kerrygold Dubliner and Kerrygold Irish Cheddar in the fridge and I hadn’t had a chance to try either yet. The vinaigrette and asparagus alone were fantastic (my 5 year old couldn’t stop eating it), and in the sandwich, they were heavenly. Your idea to use the vinaigrette on the grill pan and then grill the sandwiches on it was simply inspired. Thanks!